You can be the most cautions table tennis player in the world, and mishaps are still going to happen – the balls are going to get lost, they’ll develop dents, or, worst case scenario, they might break entirely. That’s why it’s always a good idea to buy some extra ping pong balls, just in case anything unpredictable happens. Besides, if you already own a top ping pong paddle, it’s only fair to have the right balls to go with it, right? Since you’re in the market for some new table tennis equipment, why not make sure you get the best ping pong balls for the money? And while we’re on the subject, I’ll list best ping pong tables in another article, so take a look if you’re interested in that, too! That’s why I decided to dedicate this entire article to helping you get your money’s worth. Not only will I give you some tips on how to recognize the best of the best, but I’ll also include my top 5 favorite models currently available on the market. Whether you like to play table tennis as a way to relax with friends after work, as a beginner or a serious competitor, there’s surely a perfect fit for your needs – so, let’s find you the best ping pong balls! First off, keep in mind that the best ping pong balls don’t offer a wide variety of choices material-wise. There are only two materials to discuss here – polystyrene and celluloid. Also known as the „poly” balls, the best ping pong balls are now mostly made of plastic polystyrene, and they’re the standard choice for worldwide official events overseen by the International Table Tennis Federation. The main reasons behind this are that „poly” balls are generally safer when it comes to storing and transporting them, and they’re more environmentally friendly, which is always a huge plus. That wasn’t always the case, though. Celluloid, introduced into the world of table tennis in the early 1900s, was the staple material for the best ping pong balls for more than a century. However, that changed in 2011, when ITTF (International Table Tennis Federation) decided to make a switch to polystyrene. Celluloid balls do have their benefits, though, most important one being affordability. If you’re looking to get some practice ping pong balls at a low price, these might be a good choice for you. If you’re not sure about the material, check the inscription. Being more prominent than their celluloid counterparts, which are listed as „40mm”, polystyrene ping pong balls are labeled as 40+ table tennis balls. Also, make sure to avoid 38mm ping pong balls – they were replaced by 40mm balls a long time ago. It all comes down to how visible the ball will be during the game. You want a color that will stand out and be easy to detect as it bounces across the table. Keep in mind that official ping pong tournaments only allow white or orange balls. However, if you’re looking for the best ping pong balls for a fun afternoon of table tennis with friends, you can pretty much go with any color you want. As you continue browsing the market in search of the best ping pong balls, you’ll notice they have a rating system, typically ranging from one to three stars, although some brands like to advertise their products as 5-star ping pong balls. 1 Star Ping Pong Balls – Kids and entry-level players that are just now discovering the world of table tennis should probably opt for 1-star ping pong balls. If you do, please remember that these are the lowest quality balls, typically softer, and much less durable. 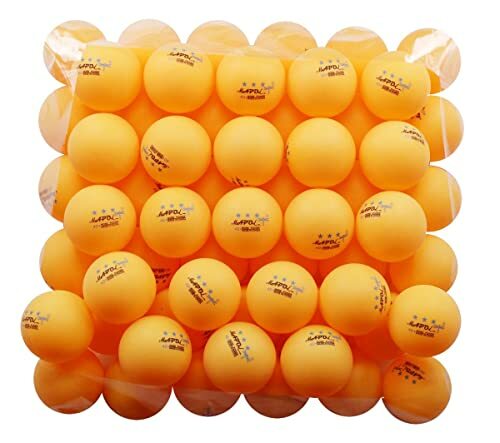 2 Star Ping Pong Balls – If you’re looking for the best practice ping pong balls, these medium quality balls are probably a good choice. They’re also a bit firmer than the 1-star ping pong balls, which makes them slightly more durable, too. 3 Star Ping Pong Balls – These are the only balls approved by the International Table Tennis Federation, and, as such, the only ones you can use for official tournaments. Of course, the 3-star ping pong balls are the ones with the highest quality, as well as firmness. 5 Star Ping Pong Balls – As I already mentioned, this isn’t an official rating – it’s a way for some manufacturers to present their product as superior to those with a 3-star rating. More often than not, though, there’s no difference in quality between the two. The video below sums everything up rather well, so make sure you check it out! As with anything else, it all depends on what you’re looking to get – best ping pong balls for tournaments, or something more casual. I mentioned that celluloid balls are generally cheaper than the poly variety, so let that be your first clue for setting a budget limit. The price may also vary depending on the star rating, as well as the number of balls you’re buying. In general, though, you should be able to find the best ping pong balls somewhere within the $10 to $30 range, but more on that in the next section of this buying guide – so keep on reading! Okay, time to check out my top 5 choices for the best ping pong balls currently available on the market! If you’re a casual player, someone who likes to play table tennis with friends, or you want a set of balls you can use to work on improving your game, consider Mapol’s 50-pack the best practice ping pong balls. They’re reasonably durable, meaning you won’t dent or break them that easily, and for this price range, they offer some decent bounce consistency. Another thing to like about these balls is their color. Orange is not only easy to spot during the game when the ball is flying from one end of the table to the other but when they fly off the table, as well – they’ll be easily found. While most balls performed exceptionally well, every once in a while there was one that either arrived dented, wasn’t entirely round, or cracked easily. But that’s the thing when you’re buying in bulk, especially at a low price like this – some issues are to be expected. Stiga 3 star ping pong balls offer an outstanding level of consistency throughout the pack, meaning all balls perform the same, which isn’t always the case. The bounce never misses a beat, and they’re incredibly responsive to spin. Plus, they’re brightly colored, so you can easily keep your eyes on them. All the previously mentioned qualities aren’t the only reason why I decided to include them on my list of best ping pong balls, though. It’s the fact that they’re suitable for a wide range of players – from beginners to experienced ones. The USATT approved them, and they meet all the ITTF requirements, which makes them an excellent choice for matches, too. So, if you’re somewhere in the middle, and you’re not quite sure which ones might be a good fit for your level, I would recommend you to consider Siga as the best ping pong balls for you. While I’m a big fan of Stiga table tennis balls, there was one thing I didn’t particularly like about them. They came charged with static electricity right out of the box, to a point where they stuck to my hands. That did wear off after a couple of days, but each time I would try to clean them with a cloth, the static electricity came back. A set of balls durable enough to withstand even the hardest of hits, and able to deliver a consistent bounce each time, as well as a fantastic level of control. Plus they perform great when you put a spin on them. Even though they’re polystyrene, these have an overall feel similar to one of the celluloid balls. If the transition to „poly” balls was hard on you, these would take you back to the good old days without breaking any regulations. 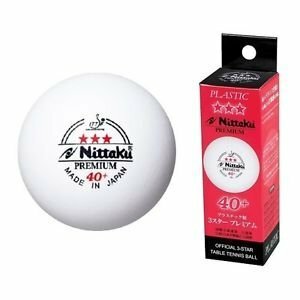 On top of that, Nittaku ping pong balls are approved by the ITTF, meaning they have the weight and size suitable for official tournaments. These are a somewhat expensive choice, though, which is why I would advise casual players to steer away. If you’re serious about table tennis, and you’re willing to spend this much to ensure you get the balls that won’t fail you when the time comes to show off your skills, these are definitely worth the money. If you’ve been in the world of table tennis long enough, chances are you’ve heard about – or even played with – Butterfly ping pong balls before. And if you did, then there’s no need for me to tell you why these are one of the best on the market. Perfectly round and durable, these balls will deliver a consistent bounce and great overall control throughout every game, be it official matches, or practice. 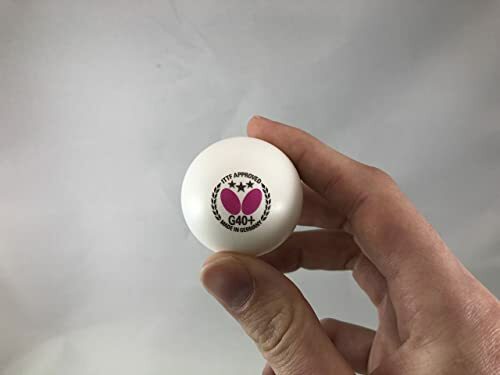 The fact that the Butterfly ping pong balls are approved not only by the USATT but the ITTF, too, tells you a lot about their outstanding quality. At the same time, it makes them one of player’s top choices when it comes to official tournaments. I don’t think they’re suitable for casual play, though. Buying a three-piece pack of ping pong balls at this price isn’t a remarkably good idea if you’re looking to have some fun. 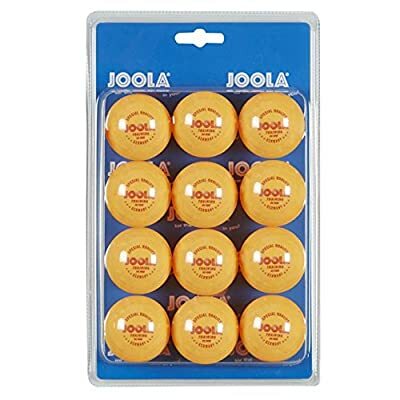 That said, if you’re a bit more serious about table tennis, and you took the time and effort to master the game, you should consider these as the best ping pong balls for you, because this level of quality at a price like this is hard to find anywhere else. Just because you’re a casual player, doesn’t mean you can’t get some decent quality, 3-star ping pong balls, right? And if you have kids that are interested in table tennis as a fun way to spend their afternoons, these balls will be the perfect gift for them. I have to admit, I was a bit skeptic about them, but they performed rather well. The bounce is mostly consistent, and they have a pretty good spin, too. On top of everything else, they’re unbelievably affordable, especially when you compare them to the previous two models. So, even if one of them gets lost (highly unlikely due to their orange color, but still) or develops a dent, you won’t be sorry. Keep in mind that these are celluloid, so don’t count on them when it comes to playing any official matches. That’s not the biggest issue here, though. These balls have a smell so strong and unpleasant that it instantly makes you realize why the ITTF made the switch to plastic balls. It will go away after some time, but until it does, you’ll have to get used to the smell. Okay, it’s time to wrap things up, which also means it’s time to announce the winner of the round-up – the best ping pong balls on the market in 2018. The problem is, which one you’ll pick primarily depends on what you’re looking to get. That’s why I tried my best to include a variety of products – best practice ping pong balls, those suitable for casual play, and options for players of all levels. 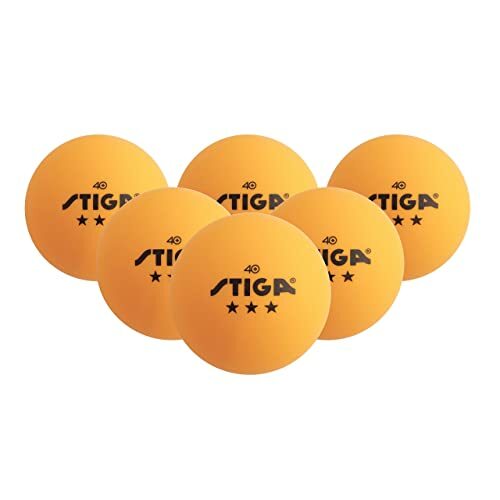 That said, some products can be considered the overall best ping pong balls, and the STIGA 3-Star Table Tennis Balls are a great example of that, which is why I picked them as the winner of today’s round-up. Do you have a personal favorite, too, or do you agree with my choice? Maybe you feel like I left something out? Let me hear your thoughts on the subject in the comment section below! www.allpingpong.com is participants in the Amazon Services LLC Associates Program, an affiliate advertising program designed to provide a means for website owners to earn advertising fees by advertising and linking to amazon.com, endless.com, smallparts.com, myhabit.com, and any other website that may be affiliated with Amazon Service LLC Associates Program.